Plaster, stucco and wall paintings at archaeological sites are a rich source of information for archaeologists, as well as for researchers engaged in the study of such areas as building technologies and materials, artistic materials and paint, and history of art. For visitors, these remains have historical and artistic value that illustrates the past. Excavating exposes the remains to the effects of the climate after a period of many years during which they were buried in the ground in stable conditions. The “excavation shock”, that is to say, the rapid drying, contraction and expansion that are brought about by fluctuations in humidity and temperature, in addition to sun radiation , causes immediate destructive and weathering processes. The exposure, conservation and study of these sensitive elements are a complex challenge that requires cooperation between archaeologists, conservators and other experts. This is needed in order to manage the excavation and treatment at the site in accordance with the archaeological research goals and the conservation requirements, and includes testing for salts, identifying weathering patterns and the study of materials and of conservation methods of wall paintings. The guide for excavating plaster, stucco and wall painting elements is intended to show archaeologists and conservators how to plan proper treatment for sensitive finds in an archaeological excavation, immediately upon the initial identification of the artifact, its exposure and conservation. It aims to provide a common language for archaeologists and conservators so as to prevent instances in which plaster, stucco and wall painting elements were destroyed or lost. They were destroyed due to inappropriate excavation methods, insufficient documentation, improper collection and transfer from the site to the laboratory or lack of suitable protection for the elements that remained in situ. When exposing wall paintings in an archaeological excavation we will find them on pieces of plaster attached to walls that fell amongst the collapse or as an in situ painting on plaster that is still connected to a standing wall. These situations are a result of how the building was destroyed. 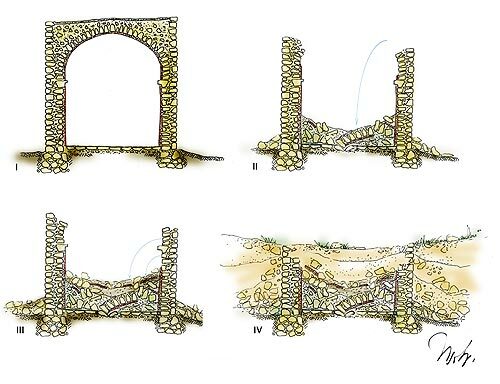 The process of collapse is a gradual one: first the ceiling and roof, followed by the upper parts of the wall, and then the lower parts of the wall (Fig. 1). 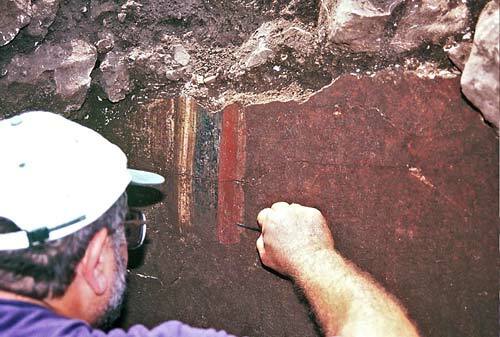 During the excavation, the upper parts of the painting will be mainly found away from the wall, toward the center of the room, while the lower parts will generally be found closer to the wall. 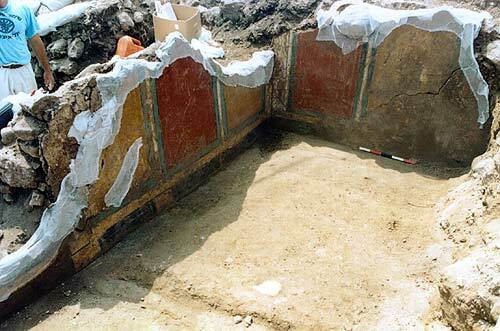 The order and place of the wall painting at the time of the excavation can therefore indicate its original location in the building. When the collapse occurs slowly, as a result of abandonment and the weathering of the building, there can be a build-up of layers of earth and alluvium between the parts of the building and the destroyed wall painting. In the case of rapid destruction, as a result of an earthquake for example, the pieces of plaster and collapse will be found on the floor, covered by later layers of accumulated fill. Figure 1. Where the pieces of plaster are found in the collapse is indicative of their original location. The upper parts of the painting will mostly be found far from the wall, toward the center of the room, while the lower parts will usually be situated closer to the wall. The guide details the main stages of work in an excavation and the conservation of plaster, stucco and wall paintings according to three states of preservation and types of intervention: (1) exposing detached pieces and their treatment; (2) exposing the wall painting, its removal and treatment in the laboratory; (3) treating wall paintings in situ. The work stages include measurement, exposure, cleaning (Fig. 2) and initial stabilization at the site (Fig. 3), collecting pieces of a wall painting or removal of a panel and assembling it in the laboratory (in cases where the painting is not conserved at the site), treatment (Fig. 4), sampling, documentation and preparation of a final report. Figure 2. A brush and scalpel are used to remove remnants of dry soil during the initial cleaning of the wall painting at Yodefat. The aim of the cleaning at this stage is to enable an initial understanding of the painting’s physical condition and evaluate its significance as a basis for deciding on further excavation and how it is to be treated. A more thorough cleaning will be done at a later stage in the laboratory or in the field prior to exhibiting the wall painting. Figure 3. In many cases parts found in collapse or panels prior to removal are in a fragile and friable physical state, and therefore it is necessary to stabilize them before collecting and transferring them to the laboratory. 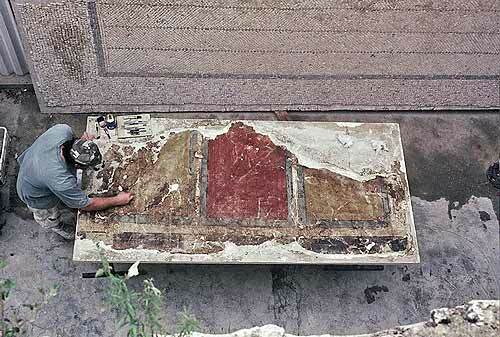 This photo shows the wall painting being stabilized by means of gauze and soluble adhesive before removing it. Figure 4. Treating a wall painting in a laboratory includes cleaning the mortar from the back of the painting and stabilizing it with a permanent support, cleaning the layers of paint and plaster and stabilizing them, integrating lacunae and the surface of the painting and the application of protective layers. We hope that this will assist archaeologists and conservators treating wall paintings and will perhaps also encourage the publication of other guides that will enrich the conservation knowledge of those engaged in preserving the archaeological heritage in the country. Download full document: "Excavation and Treatment of Plaster, Stucco and Wall Paintings in Archeological Sites - A Guide for Archeologists and Conservators".